At least three Sudanese protesters were wounded by gunshots Tuesday when security forces dispersed rallies in the capital, witnesses said, after a week of demonstrations against President Omar al-Bashir’s three-decade rule. A witness said security forces barred protesters at one location in Khartoum from marching on the presidential palace by firing tear gas and shots in the air. Three witnesses told Reuters that three protesters had been wounded by gunshots, one of them in the head. A police spokesman was not available to comment. Officials and witnesses previously said at least 12 people had been killed in the unrest so far. Amnesty International said Tuesday that at least 37 people had died. 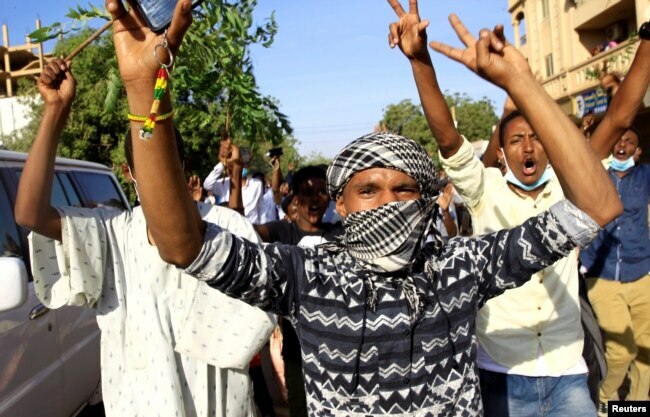 Rising prices, shortages of basic commodities and a cash crisis have driven protesters to the streets across Sudan to demonstrate against al-Bashir, who took power in a military coup backed by Islamists in 1989. Demonstrators chant slogans as they march along the street during anti-government protests in Khartoum, Sudan, Dec. 25, 2018. Protesters, who gathered at several locations across Khartoum on Tuesday to march on the palace, have previously targeted offices of the ruling party, torching several of them. Three witnesses, one of them a doctor who has been offering medical support to the protesters, said three people were wounded by bullets. “Three guys were shot next to me — one in the neck, one in the chest and one in the head,” one of the witnesses said by telephone, asking not to identified. Since the demonstrations started spreading on Dec. 19, police have dispersed protesters with tear gas and sometimes used live ammunition, residents say. The authorities have shuttered schools and declared curfews and a state of emergency in several regions.